I sure wish someone would give me a Dodge Challenger! It could even be a 318 car and I would be happy! 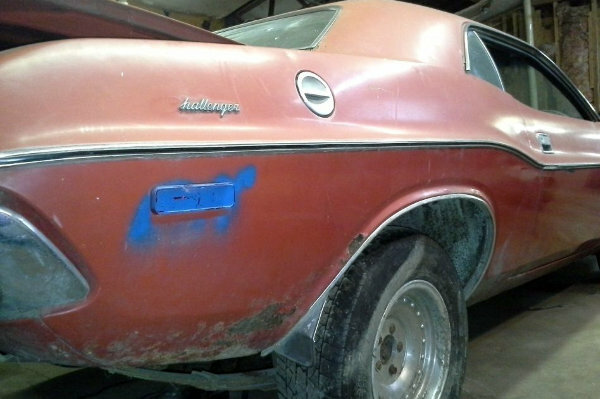 This ’72 Challenger was bought by the seller’s father in late the ’70s. It was parked ’79 and moved around a couple times, eventually into a pole barn. In 2003 it was given to the seller, who started working on it, but didn’t get very far on it. Seeing as they weren’t getting anywhere with it, they gave it to another family member, who you guessed it parked it in their barn. Well the family member called up and asked them to come get it back, so now it’s listed here on eBay and is back in Allenton, Michigan awaiting a new owner to finally do something with it! I’ve noticed that most mid-level Mopars have had their engines swapped or messed with and this one is no different. It rolled out of the factory with a 318, but at some point in it’s life had a 383 installed. The 383 is a respectable motor and offered considerably more power than the 318. Being a block built in ’66 means if it is a base engine it was rated at 270 hp, so it isn’t a huge jump in performance. The seller doesn’t state if it’s the 2 barrel or 4 barrel model, which could have a big difference in power. The body looks straight on this one, but there is definitely rust. 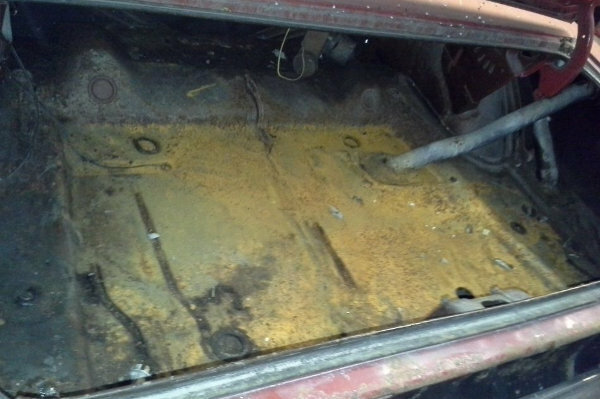 I don’t see any large holes anywhere on the outside, but take a look at the underside and it’s a different story The trunk floor actually looks pretty good, so that is hopeful! You’ll likely want to have an inspection done to know for sure just how about the rust issues are. If they are limited to easy to access areas, it might not be too difficult to fix this one up. If I were just given this Challenger, I wouldn’t mind not knowing which 383 it has or that it has rust issues. I wouldn’t even mind that the original engine is missing. But if I’m going to have to spend $3,000+ for this project, I would want to know more about the car. Let’s just imagine for a minute though that they were just giving this Mopar away, what would you do with it? Since it isn’t already original, I would go a little crazy and find a big block for it, fix the rust issues, remove the rubber body trim, upgrade the brakes and make this into one mean street rod! So what route would you go with it? 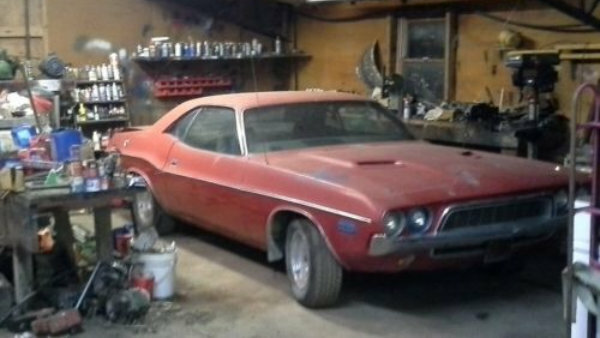 Kind of hard to buy a ’72 dodge in ’70, ain’t it? That is a great story, and worth well over 3K. The 383 was a lot more engine than the 318 ever thought about being. 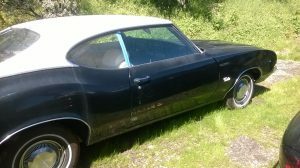 How did the original owner buy it in ’70 if it’s a ’72? Thanks for catching that, I meant to say late ’70s. First of all, a round of applause for the photos on this one. Well done. You really have a clue as to what you are bidding on. I am sure we can all agree with that. I know it is Michigan, I am in Illinois, so I guess I can understand how a car can be in this poor of condition when only on the road for 9 years or? this story is like one of those word math problems starting out with “if a train leaves New York at ….” I just don’t understand how this car is this rusty, re-worked in parts when having spent most of its time in a barn of some sort. Perhaps gravel or dirt floor? This car is and/or was infested for sure. Yikes. Hate to be the one pulling that head liner down…god knows what is up there. I would believe 193K miles and a lot more time spent out of the barn than is being stated. That or 93K miles and someone who really didn’t care for this car AT ALL! I pass. Good luck on this small disaster. Again, a car that will have far more invested into it to make it right than it will ever be worth in our lifetime. Am I missing something here? There are no pictures of the drivers side, underside, interior or engine.How is this well done? No matter what year it was bought, this puppy is going to bring down some big $$$$. 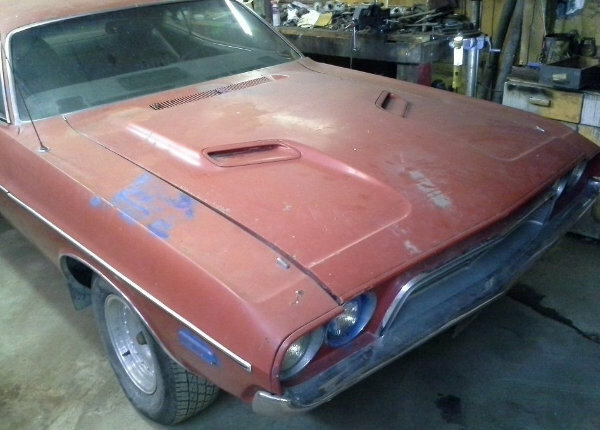 Still in demand and should bring a good dollar… I like it..
Love the car, have a friend who has 2 Challengers, a 318 car he drives all the time and a 440 show car I almost bought. This car will need extensive bodywork and the seller has done a great job of being honest with his description and pictures BUT way more work and investment than I could handle at this time in my life. Wish him well. PRO’S: Rallye Cluster Dash, looks like dash pad is uncracked, seats appear to be intact, has rare rear window defogger, interior door panels and console appear to be intact…..
CONS: RUST, RUST, RUST, RUST, RUST, RUST, RUST, RUST!!!! A great buy and relatively easy, if not necessarily cheap, project. Definite upside here. Right car, wrong year. To much rust relegates this one to parts car status. A 72 in this condition cries out restomod. Crate engine, new suspension, Wildwoods on all four corners, AC and PS. That is if there is enough steel left to survive dipping the body. Can’t determine that from the pics. I know very little about bodywork, so please excuse a dumb question. Is it actually possible to restore a car that is so badly eaten away? Sheet metal is one thing, but this car looks to have some real structural issues. How would one even begin to bring this one right? You can fix anything with enough money, a fabricator, and a parts car. If a car needs major restoration to the body, frame, engine, interior, etc. as this car does I think the buyer needs to get it cheap or it will end up being parted out. Drivers go for 8 to 12,000. Restored this is a $25,000 car on a good day. I don’t know how bad the rust is with out inspection, but in my experience it is never better than it looks in the pictures, always worse! The eye can’t see what is going on between the panels, and rust doesn’t know where to stop. 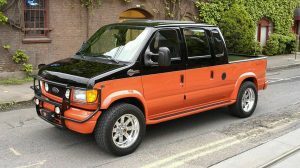 Cool car for a full on modern everything make over. John, to answer your question directly, this is a unibody car, meaning the body and frame are “one”. If bent but the steel is still good, the car can be straightened out on special equipment for that purpose. If there is too much decay, then it must be scrapped. That’s why it is unlikely feasible to restore a ’72 in the condition versus restomodding it. A restored ’72 with this settup isn’t that valuable. The difference in a restomod is that the year means less to the value because the value is in the modenization and reliability while appearing to be old from the body perspective..
My first car was a ’73 Barracuda 318 auto. 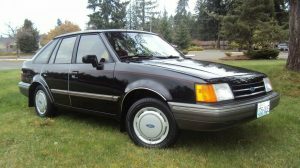 Pretty much a stripper model, but had Rear Defog like this this one, and fender mounted turn signal indicators which must have been rare because I never see them on advertised cars. Through BF’s we have seen an infinite number of sellers who offer little assistance by running ads that feature 4 blurry outdated photos and an ambiguous 5 word description….at least this seller put a little effort into it.